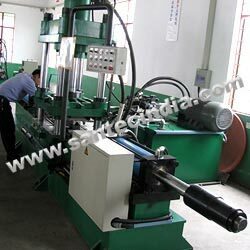 Tube end former is a production end forming machine used to expand the end of a tube. The machine uses segmented fingers to minimize the tooling marks on the tube as the tube expands. No clamp die is used for this process. This means customers can have a bend close to the end of the tube and still expand the end of the tube. The user inserts the tube over the die fingers and then holds the cycle start button during the expand operation. Once the ram stroke is complete, the hydraulic control valve automatically returns the ram to its home position. All end formers are designed and tested in house. Double hit tube end former is designed to form the ends of a tube for industrial applications. Typical end formers may be a 37 degree flare, double flare, bead or a bump o-ring groove type end form. Quick change tooling is used to keep change over times to a minimum. This tube end former is a production machine used to expand the end of a tube. The end former uses segmented fingers to minimize the tooling marks on the tube as the tube expands. No clamp die is used for this process. This means you can have a bend a tube close to the end of the tube and still expand the tube. The user inserts the tube over the die fingers and then cycles the end former.